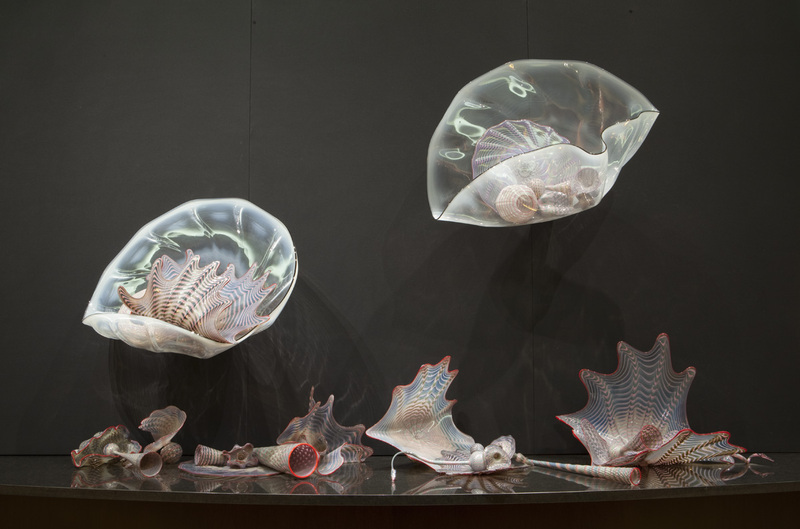 Our upcoming exhibition Into the Deep takes a look at glass artists who are inspired by the ocean. 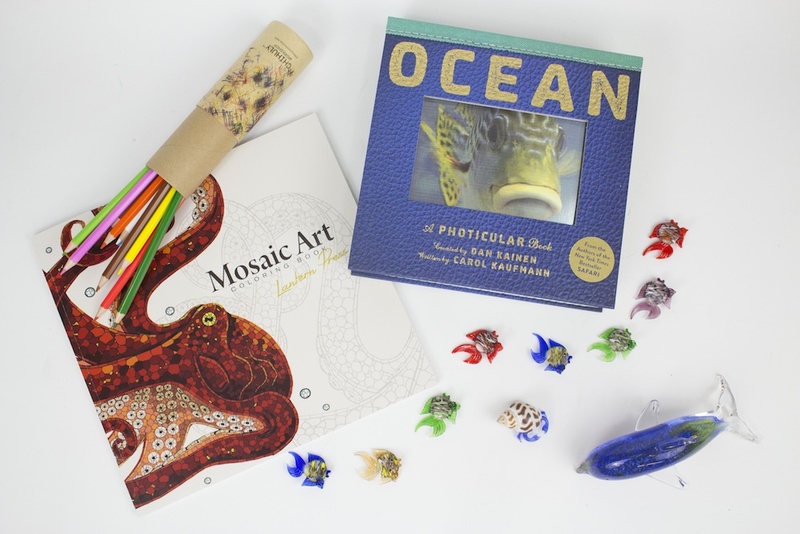 Glass is an incredible medium, and it allows artists to capture the effects of being underwater better than any other artistic medium. 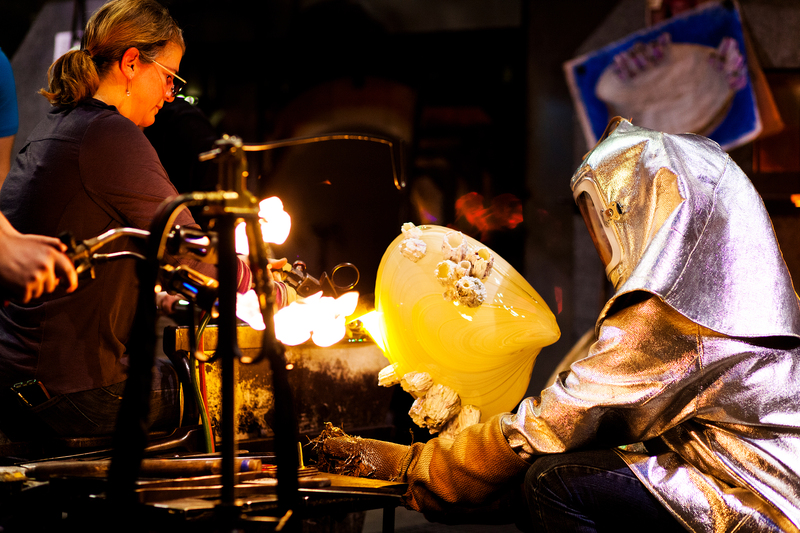 Last November, artists Kelly O’Dell and Raven Skyriver collaborated on a series of barnacle-encrusted shells, which will be featured in the exhibition, in the Museum of Glass Hot Shop. 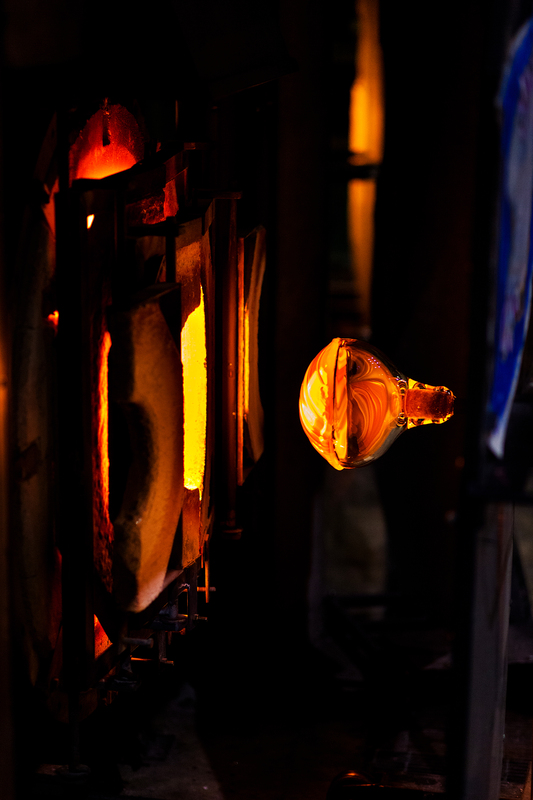 The complex process is a great example how versatile the medium of glass can be. The stripes on the clamshell begin as flattened pieces of cane (colored glass) which are heated until they are hot enough to stick together. 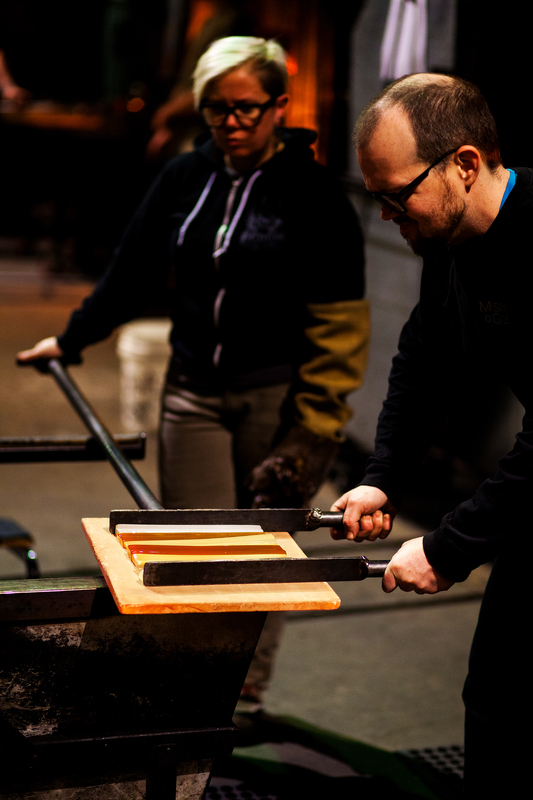 Here, Nick Davis, MOG’s Hot Shop Tech, is squeezing the hot pieces of cane together so they form a flat panel. 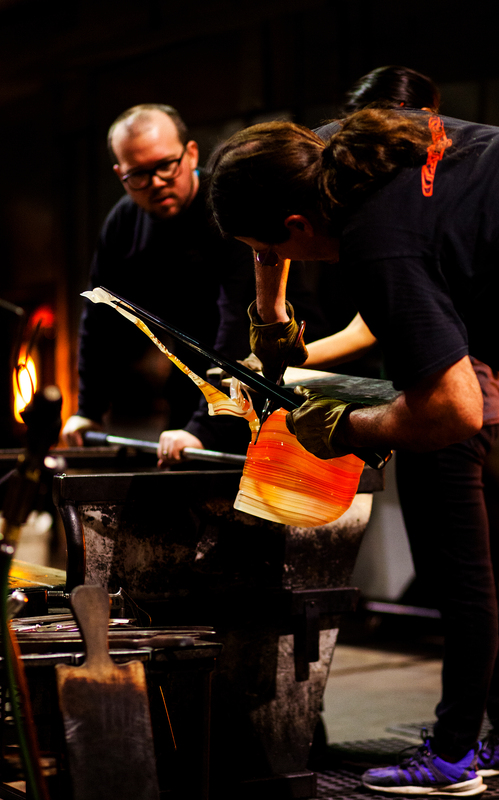 Next, artist Raven Skyriver picks up the stripes of cane using a piece of hot, clear glass shaped like a plunger. The hot clear glass sticks to the flat panel of cane, and forms a half dome shape. The clear appendage will be used to shape the flat stripes of color into a bubble. 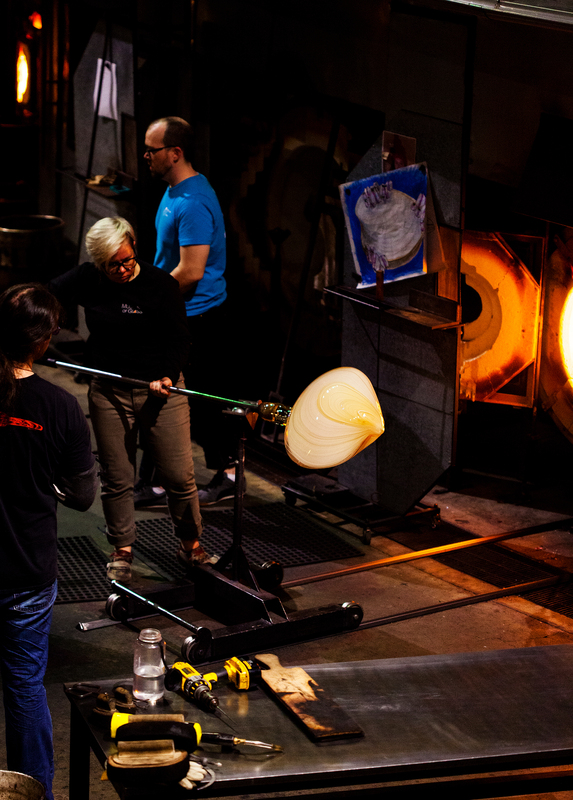 After the flattened cane is picked up onto the plunger, Skyriver uses a pair of shears to trim away the excess glass along the edge of the circle created by the plunger, sealing it into a clear glass dome with a colorful, striped base. 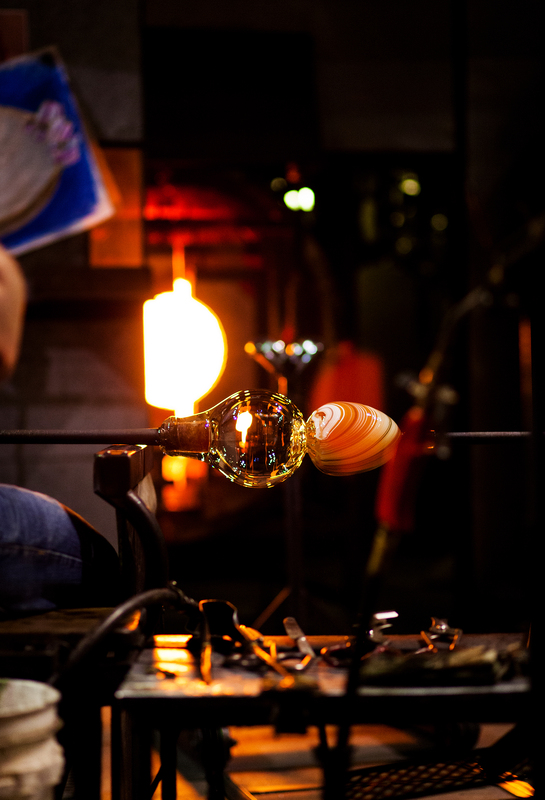 The newly-formed dome is heated in the glory hole, and then rolled across a steel table, called a marver, to create a smooth bubble that is half clear glass, and half colored cane stripes. 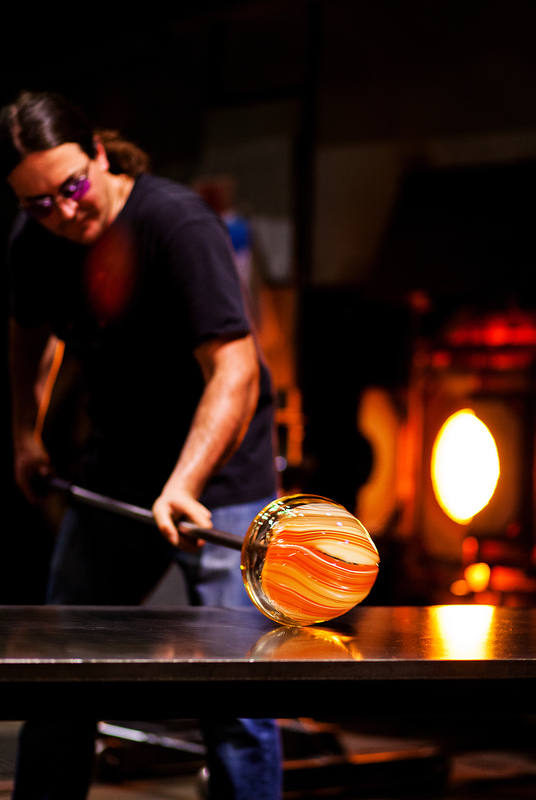 In order to start making the clam shape, the colored stripes need to be removed from their clear glass holder. The stripe canes are pinched inward to form their own bubble, and then connected to another blowpipe, so that they can be separated from the clear glass, and blown into a clamshell shape. Tah-dah! 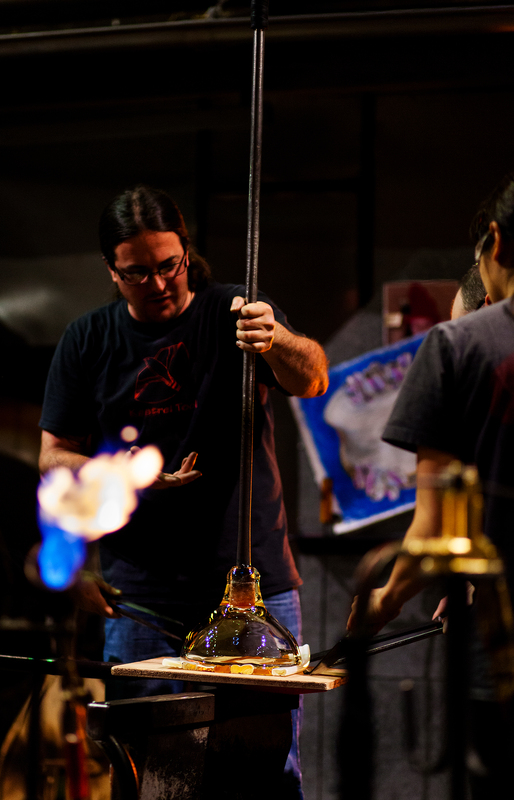 After about 45 minutes of adding more clear molten glass, inflating the bubble by exhaling into the blowpipe, and carefully sculpting the shape with tools, the bubble is beginning to look more like a clamshell. You can see the stripes from the cane, which have stretched and curved as the glass has been shaped. 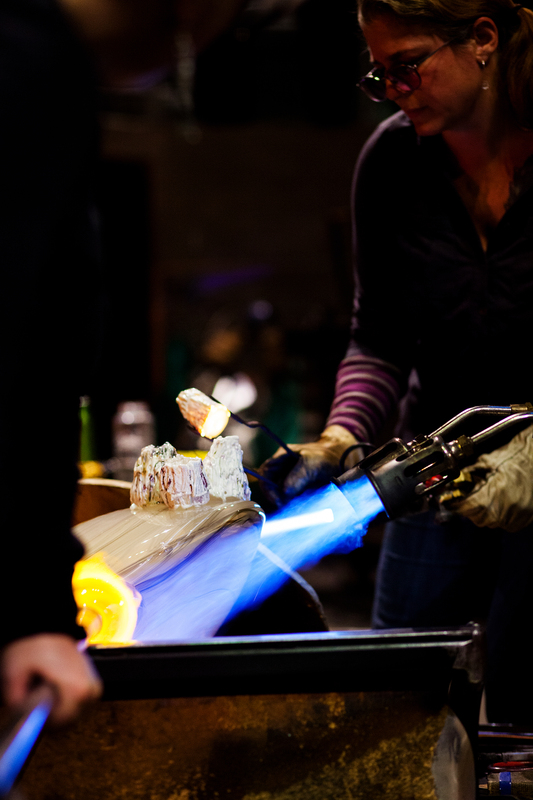 Hot Shop Team member Sarah Gilbert transfers the piece from the bench, where the artists are working, to the gloryhole for it to be heated back up to above 900 degrees Fahrenheit. This is important to keep the glass from cooling too quickly and cracking. After the artists are satisfied with the shape of the clamshell, it is time to attach the barnacles. These fabulous acorn barnacles are also made of glass. 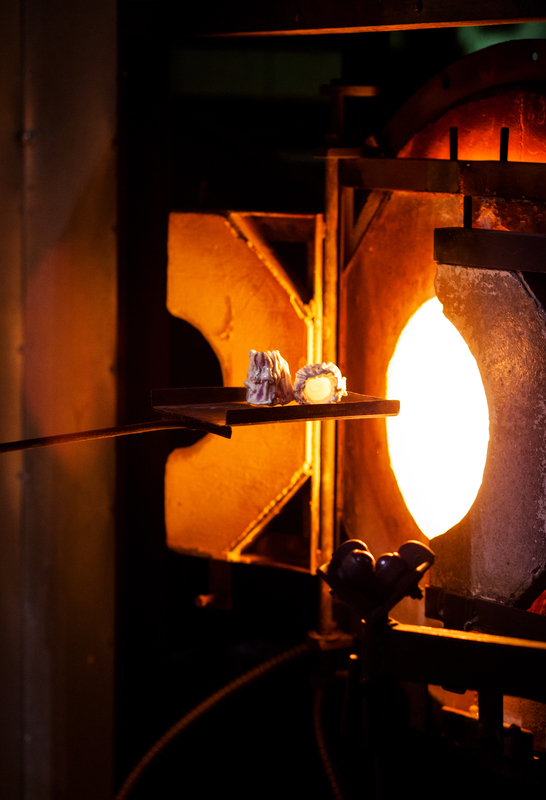 They were created ahead of time by Kelly O’Dell, and in then placed in a furnace in the Hot Shop calls the garage – named because pieces are heated to 900 degrees and “parked” at that temperature until they are ready to be used. Just before the barnacles are placed on the clamshell, they are loaded onto a pastorale (a flat, metal tray) and heated in the gloryhole to make them the same temperature as the shell. Kelly O’Dell attaches a heated barnacle to the clamshell using a pair of tweezers. 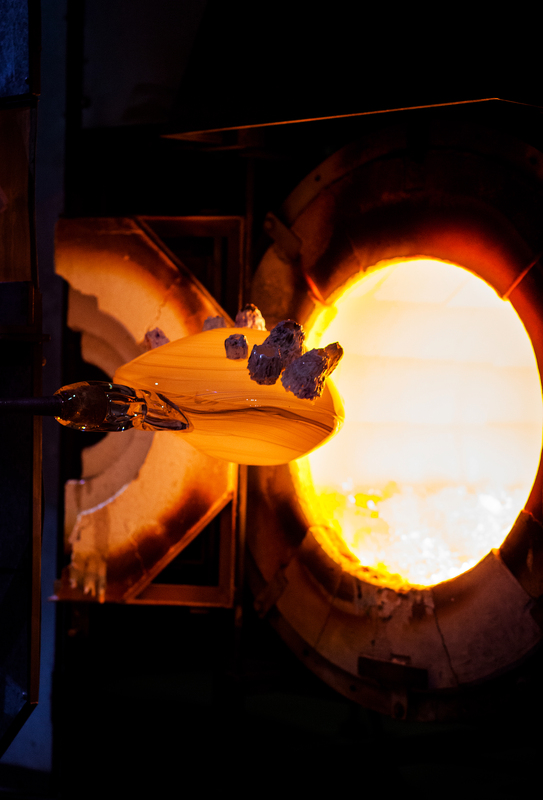 A torch is being used to keep the rest of the glass at the same temperature. 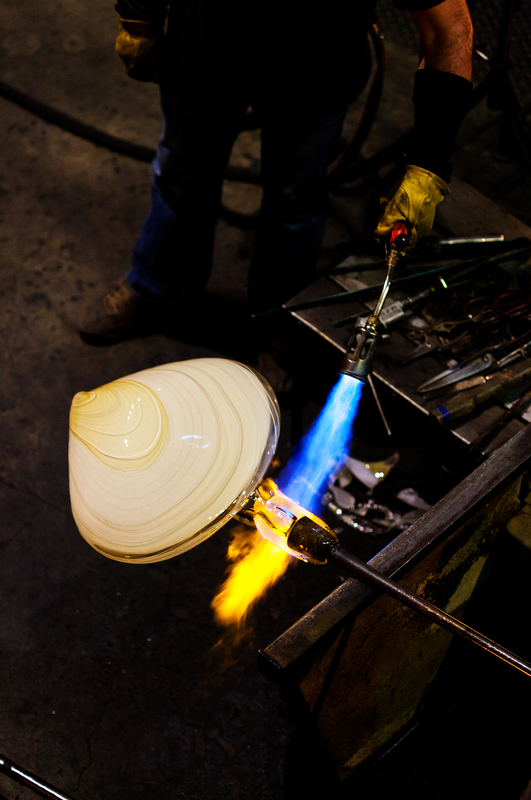 Kelly also has a torch which she is using to heat the bottom of the barnacle so the hot glass can stick to the surface of the clamshell. After the barnacles are applied, the whole piece is heated back up in the gloryhole. Now that all of the barnacles have been placed on the shell, the piece is complete. Water is dripped onto the end of the piece, which causes a crack to form where the piece meets the punty (the metal rod it is connected to) and allows the piece to be broken off of the pipe. Success! The finished piece is rushed to an annealer, so that it can be cooled slowly overnight to room temperature. 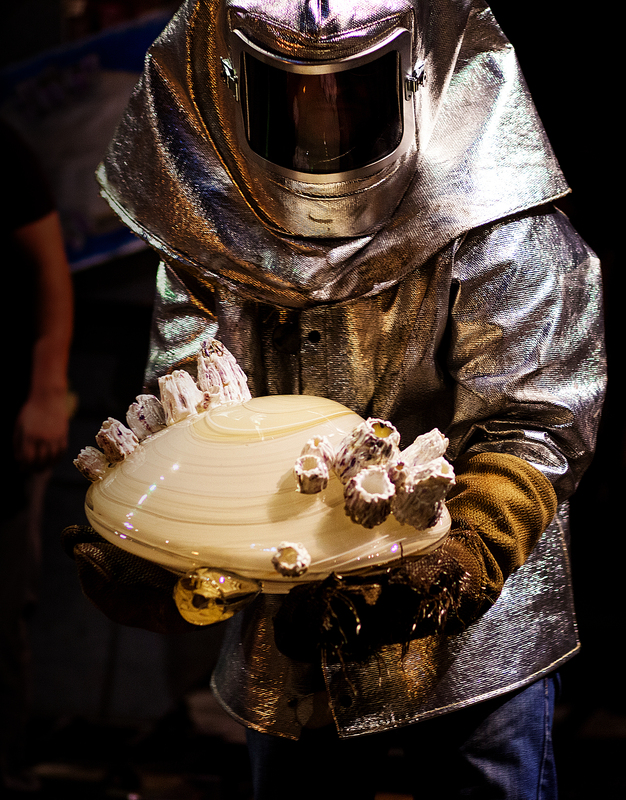 After the piece is completely cooled, it is coldworked to add texture to the surface of the shell, and a mount is made. 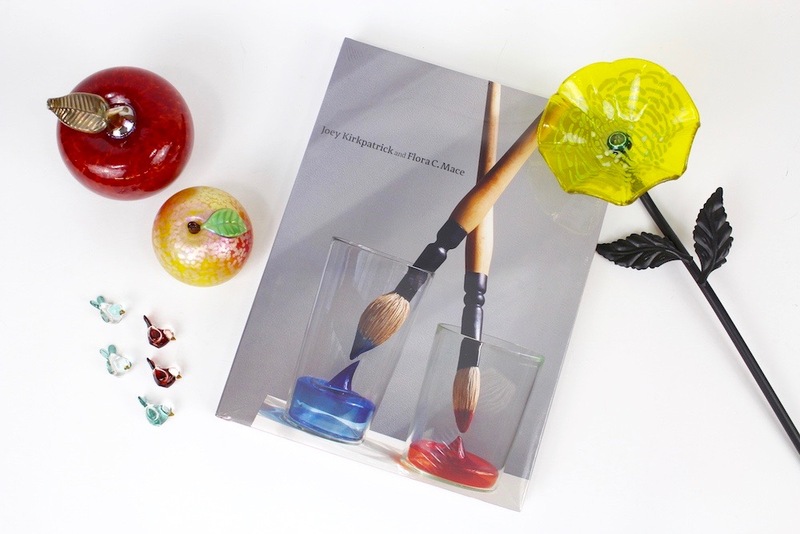 Photo credit: Kelly O’Dell (American, born 1973) and Raven Skyriver (American, born 1982); Treasure-trove, 2016; Blown and sculpted glass; 12 x 16 x 13 inches (30.5 x 40.6 x 33 cm); Courtesy of the artists; Photo by Kp Studios. The finished piece, Treasure-trove, will be one of the many ocean-inspired pieces featured in Into the Deep. The exhibition opens September 24, 2016. Come check it out! 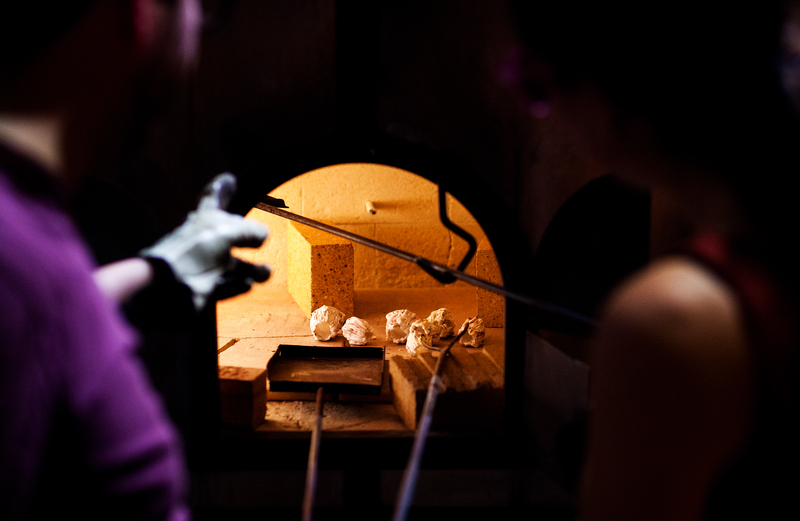 Thanks to Alex Grümmer for the awesome Hot Shop photos! This entry was posted in Art, Artists, Exhibitions, Glass, Hot Shop, Museums and tagged Alex Grümmer, barnacle, cane, clam, clamshell, glass, glass art, Hot Shop, Into the Deep, Kelly O'Dell, marine art, marine enivronment, marine life, Nick Davis, Raven Skyriver, Sarah Gilbert on May 27, 2016 by Museum of Glass.